Soon after DeMarcus Cousins entered the free-agent market in July, the still-injured star signed a one-year, $5 million deal with the defending champion Golden State Warriors. 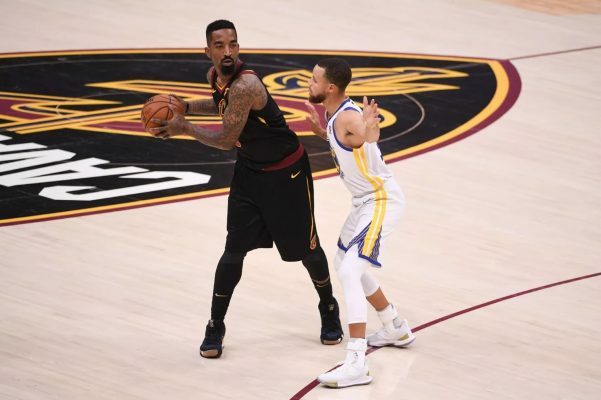 The move came as a shock to many, but Cleveland Cavaliers guard J.R. Smith offered a succinct response to a Twitter follower about his opinion on the subject. Cousins suffered a torn Achilles last January while playing for the New Orleans Pelicans. While he was expected to sign a one-year deal with some NBA team in order to give him the opportunity to sign a more lucrative contract next July, the Warriors were not among the teams speculated about by media and fans. Due to the severity of Cousins’ injury, he’s not expected to begin playing for the Warriors until perhaps midseason. However, with the Warriors having already been heavy favorites to win their third consecutive NBA title and fourth in five years, his decision simply offers strong reinforcement of that likelihood. The attitude of Smith regarding Cousins mirrors the same type of remarks that followed Kevin Durant‘s signing with the Warriors in July 2016. At that time, Durant’s former team, the Oklahoma City Thunder, had just lost a seven-game Western Conference finals series to the Warriors. The move was criticized because Durant was seen as simply joining a team that was already potent enough to win without his services, with the then-Warriors going on to win the next two NBA championships. Smith has been on the trading block during the past offseason, but is expected to be a part of the Cavaliers’ rebuilding project when the regular season gets underway on Oct. 17. The 33-year-old veteran is looking to have a comeback season after two consecutive down years.